Be transported into the surround-sound experience right at home with the Home Theater Sound System by Sharper Image. 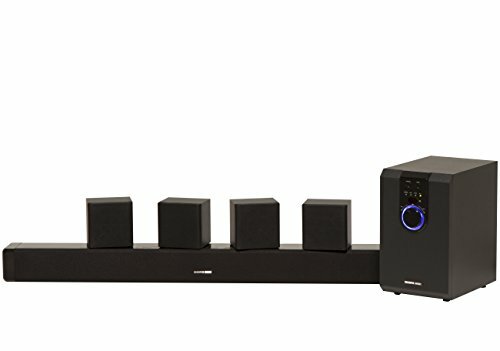 This six-piece emits 5.1-channel surround sound, creating a theater-like listening experience. Home Theater in a box includes: sound bar, subwoofer, and wall-mountable satellite speakers. This home theater system connects directly to TVs of any size, or it can be used to enjoy content from a Bluetooth-enabled smartphone or tablet. Control volume and input mode directly from the subwoofer, or use the included remote to control music playback. Also included are the mounting hardware and RCA cables that transform the living room or family room into a soundstage right out of the box. Be transported into the surround-sound experience right at home with the Home Theater Sound System by Sharper Image. Control volume and input mode directly from the subwoofer, or use the included remote to control music playback. Also included are the mounting hardware and RCA cables that transform the living room or family room into a soundstage right out of the box.